(Nanowerk News) When researchers dream about electronics of the future, they more or less dream of pouring liquids into a beaker, stirring them together and decanting a computer out onto the table. This field of research is known as self-assembling molecular electronics. But, getting chemical substances to self-assemble into electronic components is just as complicated as it sounds. Now, a group of researchers has published their breakthrough within the field. The group consists of first-year nanoscience students from the University of Copenhagen. Thomas Just Sørensen, an associate professor at the University of Copenhagen, spearheaded the research project. The groups result has been published in the internationally recognized journal ChemNanoMat ("Template-Guided Ionic Self-Assembled Molecular Materials and Thin Films with Nanoscopic Order"). Sørensen believes that the result will spawn new breakthroughs: "This is a clear step forward towards self-assembling electronics. By mixing solutions of the right substances, we automatically built structures that in principle could have been solar cells or transistors. What is more, is that they were built in the same way that nature builds such things as cell membranes," says Sørensen. Sørensens co-authors are the entire first-year of University of Copenhagen nanoscience students. This impressive feat is the result of a restructuring of the nanoscience programme in 2010, from a programme structured upon research-based instruction, to one that uses teaching-based research. For their first assignment, the students were simply asked to design, conduct and analyse a range of experiments. The new instructional type has shed research results every year since. However, it wasn't until 2013 that a result was ready to be published. "For us as a university, the big news is obviously that first year students conducted the research. But, we achieved a very significant result in molecular electronics as well," states Thomas Just Sørensen. Electronics are normally produced in such a way that one "draws" components onto a silicon wafer and then removes all the bits that are not part of the electronic component. This is called "Top-down" production. Molecular electronics enables the production of transistors, resistors, LED screens, solar cells and so on, using chemistry-based methods. In principle, this means that electronics can become smaller, cheaper and more flexible, as well as environmentally sustainable. But whereas one can draw an integrated circuit on silicon, molecular components must self-organise into the correct structures. This is a major obstacle in the development of methods where molecules must join and self-organise in such a way that they can be found again, according to Sørensen. "It doesn't help to have a pile of transistors, if you don't know which way they are turned. These cannot be combined in a way to make them work, and one won't know which end to connect to electric current." The secret behind the breakthrough is... Soap. The molecular components that make self-assembling electronics possible are antifungal agents used in various disinfectants, creams and cosmetics. These cleansers kill fungi by disrupting the structures of their cell membranes. This same ability can be used to create order among molecular components. 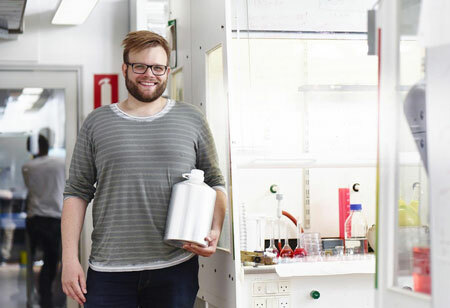 Sørensen and his students experimented by pouring a flood of various soaps, dish-soaps and washing powders together with component-like chemical substances. The mixtures were then poured out onto glass plates in order to investigate whether or not the "components" were organised by the various cleansing agents. And now they have been, says Sørensen. "Our self-assembling electronics are a bit like putting cake layers, custard and frosting in a blender and having it all pop out of the blender as a perfectly formed layer cake," says Thomas Just Sørensen. In the long term, these new discoveries open the door to developing powerful and economical solar energy facilities, as well as improved screen technologies. That being said, the molecules used in the nanoscience programme had no electronic functionality. "If they did, we would have been on the cover of Science instead of in a ChemNanoMat article," says Just Sørensen. Regardless, he remains confident. "We were able to obtain a structure simply by mixing the right substances. Even random substances were able to organise well and layer, so that we now have complete control over where the molecules are, and in which direction they are oriented. The next step is to incorporate functionality within the layers," says Associate Professor Sørensen. He is convinced that the next batch of challenges will make for perfect assignments for the many years of nanoscience students to come, and that like their current peers, these students will also have the opportunity to publish while in their first year of study.